THE APPRENTICE ~ more pics on blog.... Lol. 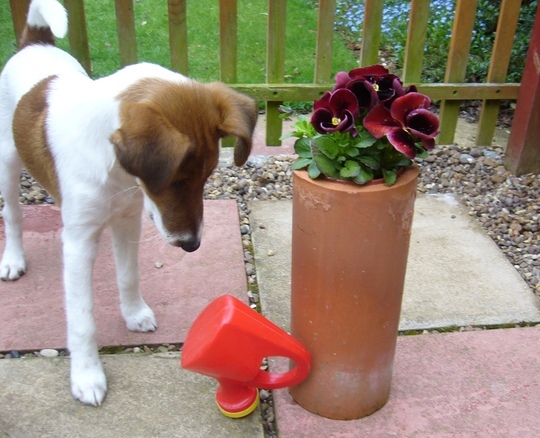 ...Truffle, my Smooth Fox Terrier puppy, working out how to water pretty pansies ~ kindly sent to us by GoY member, Janette. "no flowers were harmed in the making of this photo"
Janette sent some lovely pansies. Lovely photo! Hope Truffle doesn't enjoy eating too many of those pansy buds! Truffle seems to have a taste for salads.. Lol. If you read above, David, I had to confess to Janette about Truffle eating one pansy bud. Lol. Awww....bless him. He's getting big isn't he? Lovely pansies TT and Janette. No wonder Truffle had to have a taste. They do look good enough to eat!! Truffle is getting bigger, which means he can reach higher, higher, higher, which means everything has to be moved up, up, up, out of reach...... Lol. Truffle is a real Star! you can see he's trying to work out what you want him to do and it doesnt take him long judging by the picture on your Blog, he's a real smart doggie, love him and the pansies too! ...You know what I mean, having darling Polly. Lol. I love that "what is this" puppy look TT, Truffle is Gorgeous.. He...he....hasn't he grown TT! He has such long legs now......soon be chasing those nosey neighbours away from the fence...LOL ! I'm not surprised Truffle has grown because he's had a HUGE appetite right from the outset. He would be a chubby boy if he didn't run it all off playing games with Conker.. Lol. ... he could spray the neighbours with his water can. Lol. Great photo - I love the enquiring look he is giving the watering can! He has certainly got long legs. Truffle is still rather wobbly on those "Bambi" legs .Lol. Yes, Truffle does look puzzled. Lol. maybe some chocolate pansies would be good for easter huh??? Oooooo, no chocolate for dogs.. Truffle will get boiled egg today. Lol. Truffle has such long legs for a terrier, is this usual for a fox terrier? My brother had a brown long legged long tailed jack russell, in fact it did not look much like a j.r. Smooth Fox Terriers have longer legs than Jack Russell Terriers. Smooths are closely related to Wire Fox Terriers which are of a similar size and shape to the Smooths. The Wires don't look so long in the leg because they have the thick wiry coat on their legs, tummy and moustache. Truffle is still growing, and he will deepen in chest as he matures, so won't look so 'leggy'. Jack Russell Terriers are not recognised by the Kennel Club, and you do see a variety of colours, height, head-shape. There is also the Parson Russell Terrier, which has been recognised by the Kennel Club in recent years. These are longer in the leg than a Jack Russell. Oh, Ams, ask me anything about Terriers and you get a l-o-n-g answer. LOL. Pleased to say I'm now getting the idea of this watering can challenge. See on my blog. I got it right in the end ! I wonder what pansy flavour tastes like. lol. Not sure I would want to do that ! Do you think Truffle's opinion on pansy-tasting would be reliable ? Happy easter Terratoonie. Tref (rosygarden). I hope you don't have anything poisonous. I've just looked on the internet and it says that Ceanothus is not poisonous, but all parts can be made into a SOAP ..
Something at last to clean Truffle's muddy paws. Lol. Truffle says sorry for eating one of your pansy buds. Lol. What a little charmer. Looks like he's trying to move the watering can by some mysterious power by staring at it. Were you being serious when you said that people add pansy petals to their salads ? I've made tasty dandelion salads before now - but pansies ??!! I suppose it would a jest of colour and we could ask Truffle what they taste like!! Incidentally, do animals have an innate ability to know which plants and flowers are poisonous or harmful? I'm sure Truffle will redeem himself in the garden by the end of summer. Great pic. The pansies are lovely and Truffle is too cute. Hello Linda ~ I reckon you're right.... Truffle seems to get his own way with lots of things by just having a cute expression on his face. Lol. NN ~ Truffle knows how to fetch the watering can now, so there is hope. Lol. Truffles is growing fast .. look at those long legs ! I love the way he is looking at that can , did he work it out in the end ? Yes, Truffle is getting more like Bambi every minute. Lol. Truffle did work out how to use his watering can. You can see some more pics. of him on my blog with the same title THE APPRENTICE. Lol. I hope your slow internet connections get sorted. Must be soooooooo frustrating ! Sorry late to this...still trying to catch up ourselves.Amazing how much you miss after 4 days off line.Good pic. I'll get there eventually. Lol. Sorry I haven't been on much this week but this Tendonitis problem has been getting me down a bit and I am having to do things more slowly and not type too many words lol..
You did well to scroll down. Lol. I've missed some days on GoY due to the stress of my fencing problems. I'm starting a blog about the fencing saga today ! I think you should ask Tt for another of those cans Truffle, then you could dance as you water. Yes.... you guessed it........ Th e Can Can! :o) from Truffle :o) from Conker. Too cute...put a smile on my face! Truffle is learning fast, and is getting really good with the watering can now. Lol. I love this photo. He or she is so cute and inquisitive. what are fox terriers like in temperament. Truffle is a male Smooth Fox Terrier... They are very lively dogs, but generally good natured with very waggy tails... Intelligent and full of energy !